A relatively large modular river setup has been on my Things I Want To Build list for years. 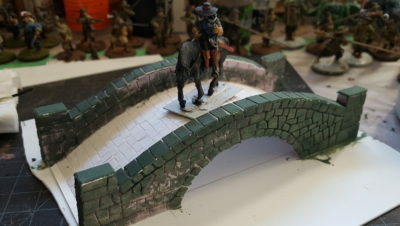 I went through the excellent set of scenarios that come with Pikeman’s Lament recently with an eye toward what additional scenery I might need to do them properly, and one of the scenarios is a bridge seizing/river crossing that needs a river the long way down the table — suggested table size for Pikeman’s Lament being 4’x6′. Perfect, a good reason to shunt the river project to the front of the queue as my summer project! 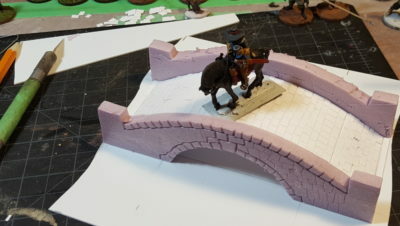 It’s also universal scenery that I can use on pretty much any of my tables, possibly with alternate bridge modules eventually to better match, say, my Russian Civil War setup or even Infinity’s cyberpunk future! To check proportions and the basic idea I fired up Inkscape. You can work in real-world units in Inkscape really easily, so it’s ideal as a super-basic quick layout tool, faster than doing things by hand on graph paper and cheaper than wasting materials! 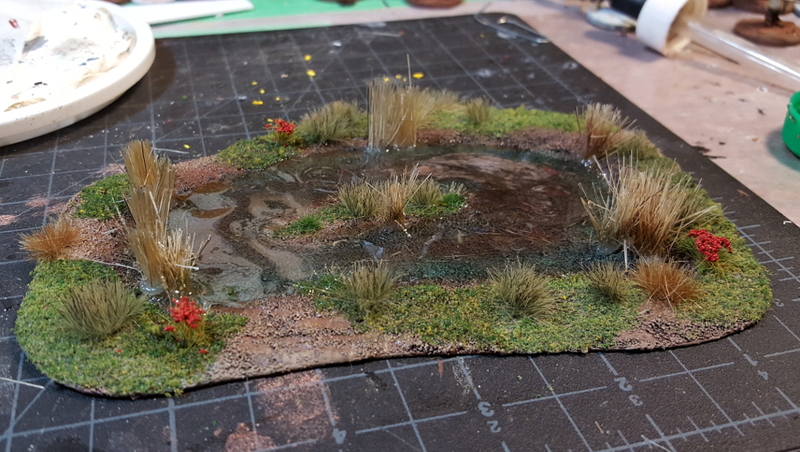 I decided on 6″ wide modules with a 3″ wide river in between 1.5″ banks, which will let me put lots of flocking and foliage along the banks. 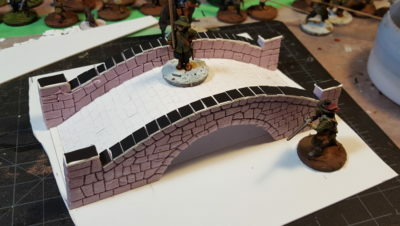 The bridge is 50mmm wide across the road part, which gives enough width for at least two figures across and will accommodate figures on 40mmm wide multibases as well. Screenshot of my river planning setup in Inkscape. Top is testing different river widths, bottom is messing with different module layouts. Click for larger. I started construction by buying a 4′ by 2′ sheet of .040 (~1mmm) styrene plastic sheet from our excellent local plastic store, Industrial Plastic & Paint. The big sheets of bulk styrene are identical to the 8×10 pieces you buy in a hobby store but much, much cheaper! I cut two 12″ by 24″ pieces, enough for six 12″ straight river modules, two 6″ long short modules, and a pair of curve pieces about 3 or 4″ long. That’s enough river to get from one side of a 6′ long table to the other at an angle, and keeping the bridge piece on one of the 6″ short modules makes placing it more flexible. The long straight sections aren’t perfectly straight, incidentally. 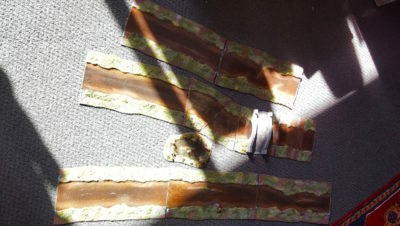 I offset each one by about a half inch, so the river will wander back and forth a bit on the table, or angle gradually one way if you align all the long pieces the same way. The long sides are cut slightly irregularly and then sanded down to smooth out any jagged edges from the scissors. 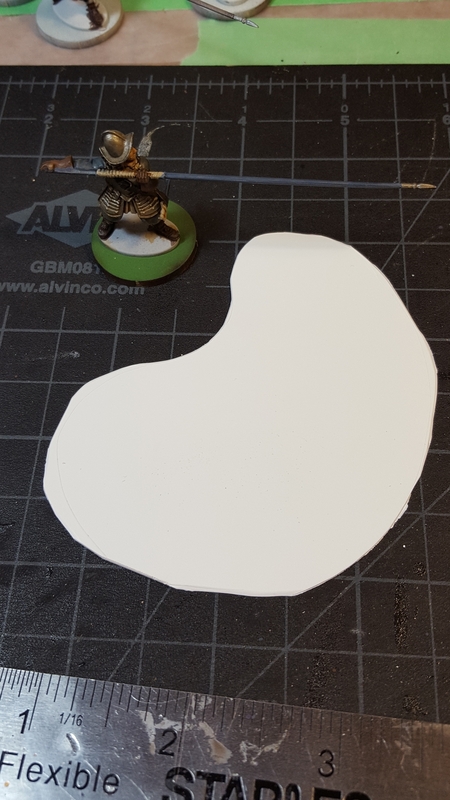 Styrene sheet all cut out for the rivers. Six 12″ straights, 2 6″ straights, and two short curve pieces, over 7 feet of river all told! Click for larger. There are cheaper material than .040 styrene, even at bulk rates, and there are certainly stronger materials, so why thin styrene? Because it’s thin, strong, and waterproof. I dislike scenery that stands up really high off the table, the styrene is going to be strong enough provided nobody abuses it, especially once all the clay, sand, glue, more glue, etc etc is on it, and I can slop paint, water, and glue around with abandon without anything warping or being destroyed. For the banks I decided to use air drying clay and picked up a cheap pack at one of our local art stores. 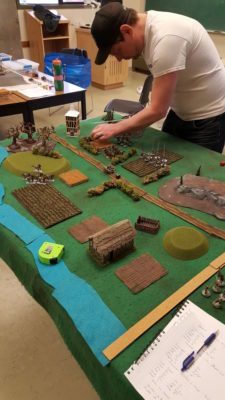 I marked the 3″ standard width of the river on the ends of all the styrene pieces, rolled out snakes of clay, and mushed them into place with my fingers. Good old kindergarten-level stuff, nothing fancy. Keep a little pot of water handy to wet your fingers in and smooth the clay. 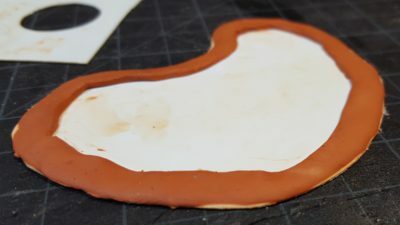 The best way to use air drying clay is actually to put a layer of white glue down on your base material, and then mush your clay around on top of the glue. 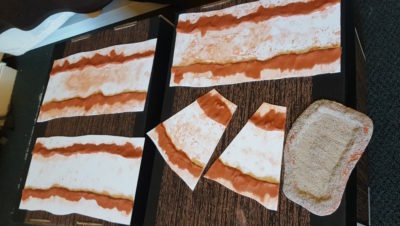 They’ll dry together and bond to the base material. I didn’t do this, so now I’m gluing the dried pieces of clay back to the styrene… this does give me a better chance to correct any warping caused by the clay drying, which has happened. Gently bending the clay straight then gluing it down with a weight on top of it – I used figure transport cases – has so far sorted out all the warping issues. 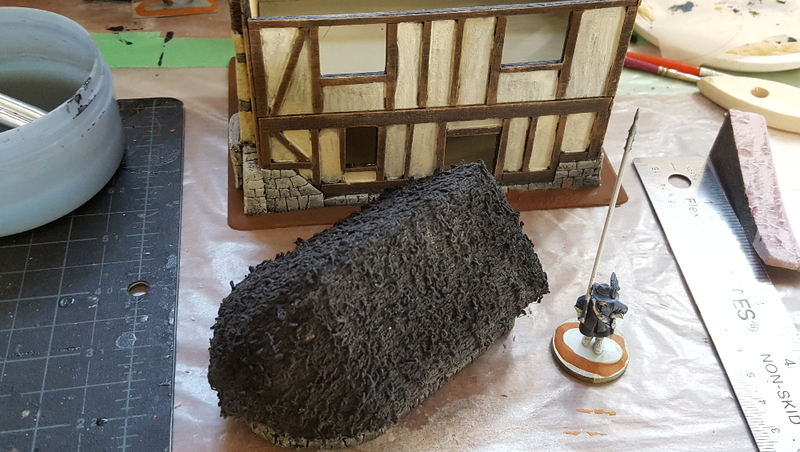 A thicker more heavyweight base material wouldn’t have warped, but see above about disliking scenery that stands too proud of the table surface. Always about the tradeoffs! With the clay done on all six straight long modules, the two curves, and one of the short straight modules – which I’m doing up as a shallow ford – I started building the bridge on the last short straight module. More on that soon! 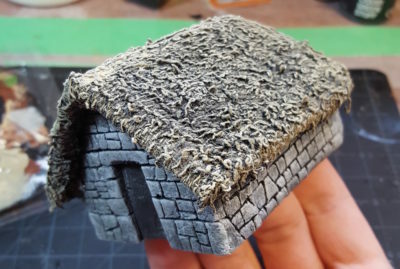 Glued down the towel thatching, slapped a coat of paint over the small stone building, added the door, and declared it done! The towel got cut into a rough rectangle, big enough to hang an inch or so over the edges of the cardboard roof on all sides. I used a hot glue gun to glue the towel over the cardboard roof, including wrapping it around the edges and underside of the sides of the roof. This gave the roof the nice thick edge you see on a lot of thatch roofs. 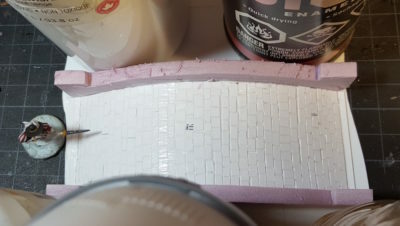 To fit the roof around the curve at the rear of the building I cut up to the peak of the curved part and layered the towel over itself further down, trimming a bit away so the overlap wasn’t too large. 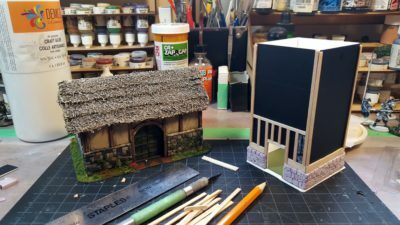 Adding black paint and glue to the roof. Click for larger. Basecoat on the thatch, with the farmhouse in the background and a 28mm Warlord pikeman for scale. Click for larger. After the black paint has dried overnight I drybrushed various shades of brown and tan over the thatch, ending with a fairly bright yellow-tan colour mixed with a bit of white, applied mostly along the ridgeline and edges of the roof, just to make them pop a little. 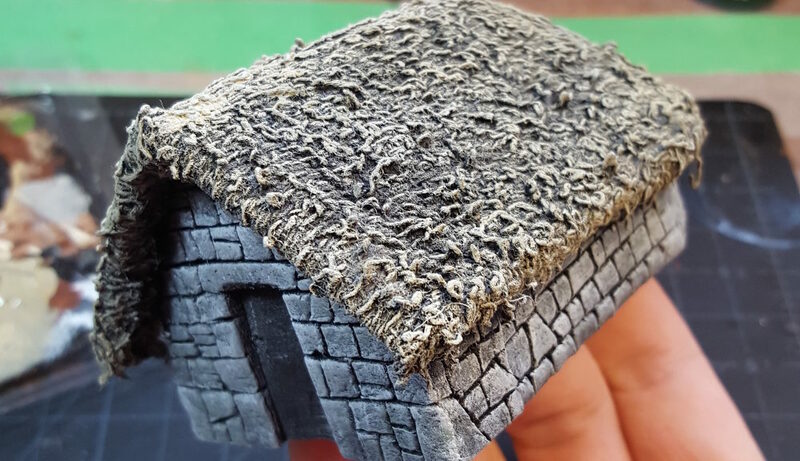 As with the base coat, don’t bother using a small brush for this, I used a 3/4″ wide cheap house painting brush for all of this work! The stonework had also been based black. 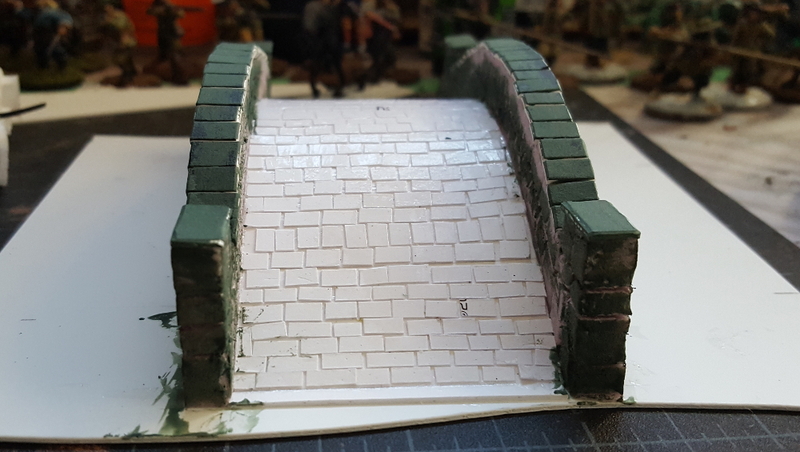 I put a few blotches of green and brown down here and there, and then drybrushed a dark grey, a pale grey, and finally a mix of pale grey and white over the stones. 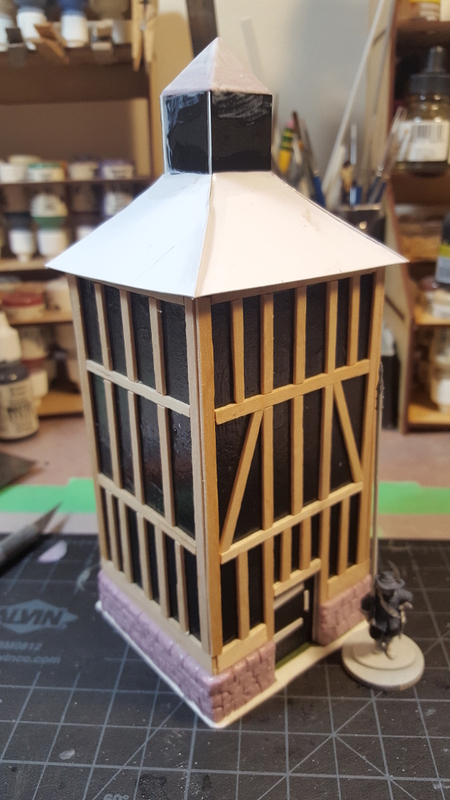 I didn’t get a photo of the door, but it was done on a rectangle of light card with narrow pieces of scrap wood from coffee stir sticks, glued down with hot glue, then hit with a heavy dark wash (mostly GW Nuln Oil) so it looked like heavily weathered wood. Painting all done, just the door left to install. Click for larger. Stonework from styrofoam is a lot of fun and fast to do; I might do a few more stone cottages or something eventually. Maybe a ruined abbey or something suitable for pulp/English Civil War crossover gaming? We shall see! 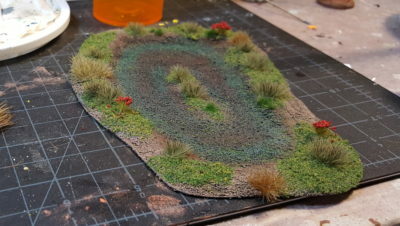 I’ve been wanting do some more area terrain – mostly flat pieces to serve as rough ground, forested areas, and the like – for a while now. 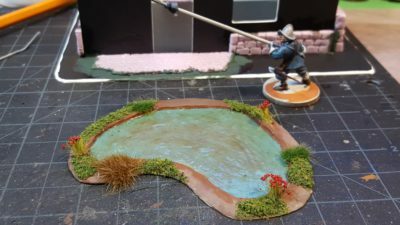 With the move back into ECW skirmish and terrain building for same, I’ve decided to start with a set of low profile stream pieces that can be used on practically any table. As a test piece, I started with a small duck pond, about 3 inches long and 2 inches wide or so. 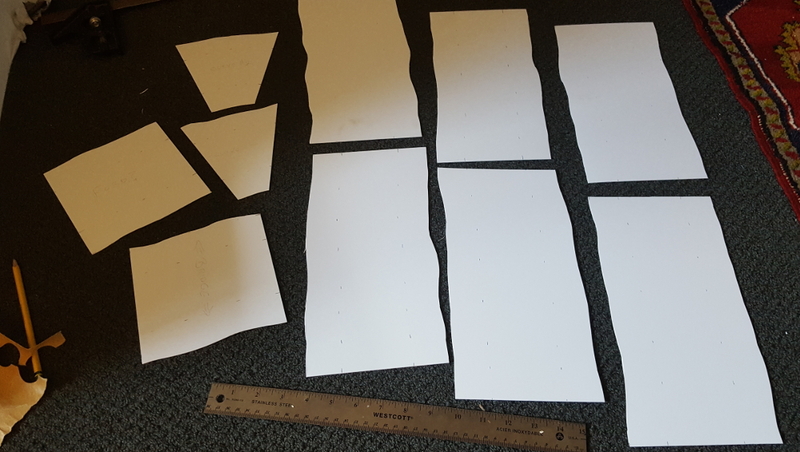 I started with an offcut of relatively thick styrene sheet (plasticard) that I think is either .030 or .040. I chopped it to roughly the shape I wanted with an Xacto, then sanded the edges smooth and beveled them slightly. 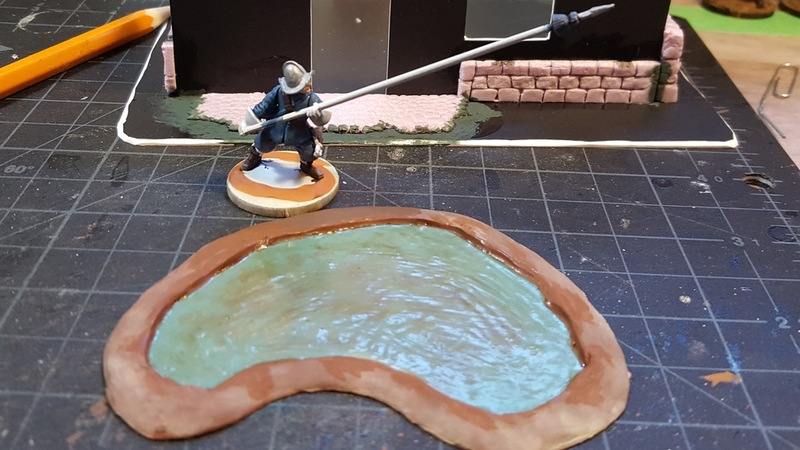 Styrene base for the pond. 28mm Warlord pikeman on a 25mm base for scale. Click for larger. 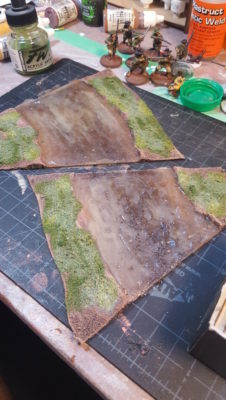 Styrene sheet isn’t the cheapest material for terrain making, but it has a number of advantages for this type of terrain. It’s sandable, making it easier to smooth down corners and edges. It’s waterproof, so you can slop paint, water, and glue around with abandon and not worry about ruining your base material. It’s also stronger than similarly thin card and more resistant to warping. I’m using an offcut of Evergreen sheet styrene for this particular pond, but for future use I plan to go down to our local plastic supply place and buy a big 2 foot by 4 foot sheet of .030 or .040 styrene; it’s sold in bulk for signmaking and other applications and it’s much, much cheaper to buy it at that scale than in the little Evergreen or Plasticraft packages at a hobby store! For the shoreline of the pond I used a long thin “snake” of Milliput, rolled out to about 2 or 3mm across. I mashed it down with my fingers, keeping my fingertips damp while working to prevent the Milliput from sticking to my hands. I tapered the outer edge down to the edge of the styrene sheet and kept the inner edge fairly vertical but only a couple of millimetres tall. Pushing your thumbnail up against the inner edge of the Milliput is an easy way to achieve this, although you could use sculpting tools too! Shoreline in place with Milliput. Click for larger. After letting the Milliput dry overnight I painted the whole thing brown. The outer edge got a couple of different shades of brown scrubbed on to look appropriately muddy, and the pond water is a greeny-blue with some brown added to the centre to make it look slightly deeper. 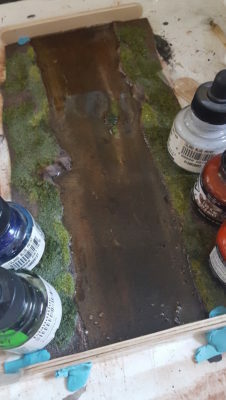 With all the paint thoroughly dry, I added several layers of white glue over the pond to give it the appropriate wet look. You could easily use gloss varnish or even a thin pour of clear or tinted resin here, but the white glue I’ve currently got dries to a high gloss and looks good as water so that’s what I used. 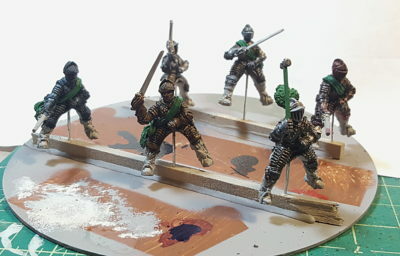 I did one coat of white glue mixed with little bit of GW sepia wash to tone down the blue-green paint a bit. Basic painting done and first layer or two of gloss glue in place. Click for larger. When layering gloss varnish, glue, resin, or whatever water-representing material you choose, it’s important to let each layer – and any paint that will wind up underneath it – dry completely before adding the next layer! Forgetting this will get you frosting and/or bubbles and other inclusions in your layering and could really screw the look of your water up. Paint that isn’t dry properly can also crack or craze under a sealant layer and really screw things up. I’ve got a set of 28mm ducks coming from Warbases soon that I’ll be added to this pond for some extra character. 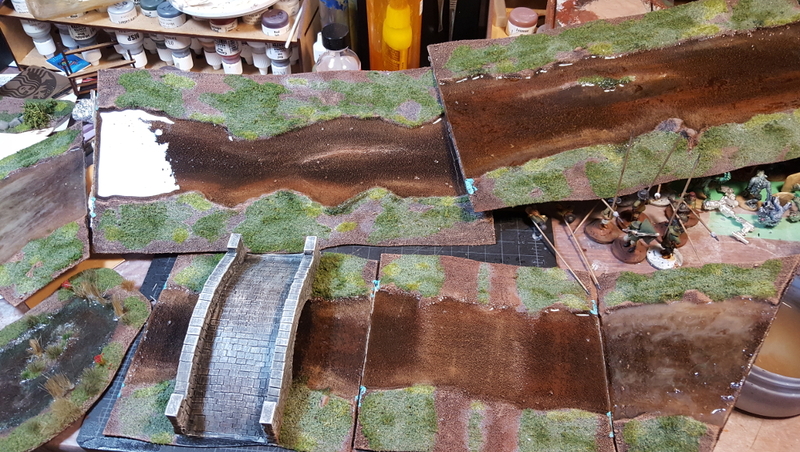 I added some flocking and tufts along the banks after the last coat of gloss had dried. As I mentioned in my last post about the things I brought home from Trumpeter Salute, one of them was a copy of Issue #87 of Wargames, Soldiers, and Strategy, their ECW special. One of the articles in there was by Tony Harwood, also known as Dampfpanzerwagon around the internet, including on the Lead Adventure Forum. Wanting more buildings suitable for an English Civil War game (and possibly for early 20th C pulp games set in the English countryside!) I decided to build my own version of Tony’s dovecote. It’s a great building for wargaming, having a minimal footprint but nice presence because of it’s height. My version of Tony’s dovecote has walls 60mm wide and a total footprint, including minimal base, of about 65mm by 65mm. It’s 120mm (12cm) to the tops of the walls. I haven’t actually measured to the top of the roof, but it’s somewhere around 20cm or so total height. Dovecote started, with the finally-completed barn on the left! Click for larger. The walls and base are 1/16th” matt board (picture framing card). The stone foundation is thin (about 1/8th” or so) styrofoam insulation, carved with an Xacto blade and pencil. The half-timbering is all wooden coffee stir sticks, most of them split lengthwise to make narrower beams. The half-timbering took a couple of hours all told, done in bits and pieces in between household chores on a Saturday. Do the big vertical corner beams first, then the horizontals, then the infill verticals or diagonals. The pattern of the half timbering is slightly different on all four walls, which seems pretty typical of this sort of Medieval/Renaissance building! Roof structure installed, half timbering done. Click for larger. The central “tower” on the roof is more 1/16th matt board, 20mm a side. The sloping pieces of the main roof are lighter card, cut to fit by trial and error. The tower roof is a scrap of styrofoam insulation, cut with a fresh Xacto blade into a four-side pyramid. All eight roof surfaces will get “slate” tiles from medium weight card, and the top of the tower will get some basic detailing from card as well. For texture in the panels between the timbers, Tony uses air drying clay in his original dovecote. Lacking air drying clay, I’m trying out stippling a fairly heavy coat of white glue over the card. 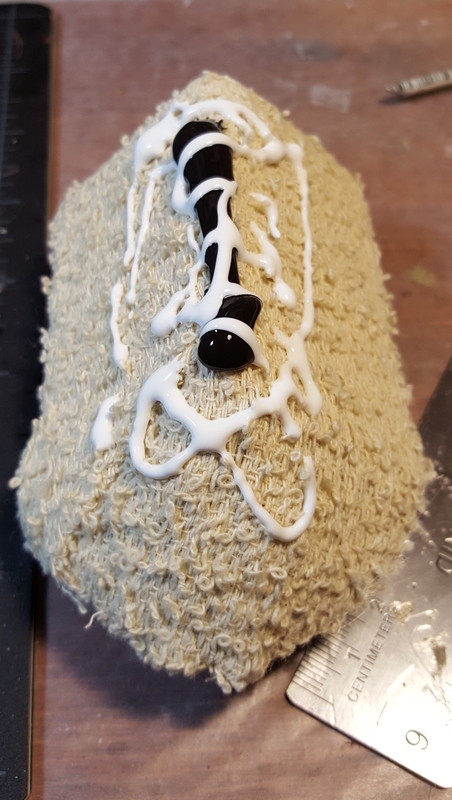 I’ll slap some paint over it soon and see how it looks; the white glue I’m using currently dries very glossy which makes it hard to see how much texture I’m actually getting. The dovecote at the far end of the table during our first games of Pikeman’s Lament. Good game, look for a proper review here sometime soon! Click for larger. On to roof tiling and paint!